Lucky Lee’s, an American-Chinese restaurant in New York City founded by nutritionist Arielle Haspel, opened its doors this week to an entirely luckless critical response. According to the restaurant, it aims to make "American-Chinese inspired food intended to make you feel great." The Greenwich Village storefront offers baked General Tso's Chicken, Orange Cauliflower and Kung Pao Mushrooms, among other wheat-free, gluten-free, peanut-free and refined sugar-free options, using descriptors like "clean," "organic" and "less oil." The health-food concept might sound like it'd fit right into one of the city's trendiest hubs, but Lucky Lee’s isn’t sitting well in Greenwich Village. Earlier this week, a now-deleted Lucky-Lee’s Instagram post went viral for the worst reason. 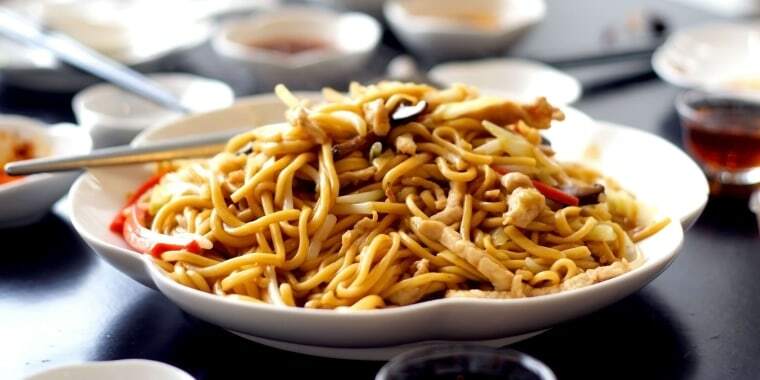 According to Eater, the post featured a serving of the restaurant's lo mein paired with a controversial caption. According to critics of Haspel and her new restaurant, Lucky Lee’s caption contributes to a well-documented history of racist Chinese stereotypes. Lucky Lee’s phrasing attracted a wave of upset and hurt online. A torrent of reviewers took to Lucky Lee’s Yelp page to shame the restaurant’s racially-charged, brand positioning, too. How offensive! White chef at Lucky Lee’s pretending to clean up Chinese food! Completely ignorant of the sophistication of Chinese food and its use of fresh ingredients for thousands of years. Go visit Asia, try the Chinese food and come back humbled! Many believe the restaurant's language reinforces stereotypes associated with Chinese culture and cooking, including that Chinese restaurants (and therefore its employees) are dirty and the cuisine is exceptionally greasy and unhealthy. And let's not forget the myth that MSG, a naturally occurring flavor enhancer commonly added to Chinese food, is to blame for symptoms like headaches, nausea, sweating, flushing and puffing. But, according to the Mayo Clinic, there’s "no definitive evidence of a link between MSG and these symptoms." In response to the backlash, Lucky Lee's took to Instagram again to further explain its brand concept and react to "negative comments." “Some of your reactions made it clear to us that there are cultural sensitivities related to our Lucky Lee’s concept. We promise you to always listen and reflect accordingly,” the restaurant wrote. And since many took issue with the restaurant's name, Haspel disclosed that her husband’s last name, Lee, inspired the name. The “Jewish-American” pair grew up in New York City eating “bagels, pastrami sandwiches and yes, American Chinese food,” according to the post. Haspel has not yet responded to TODAY's phone or written request for comment.